Posted on Friday, January 5th, 2018 at 2:46pm . You’ve finally gotten your orders, and surprise: you’re transferring to Tampa, FL! Oh no…Tampa, FL? It’s so far away from my family. Here at PCSMoves.com, we're continuing a series of posts about potential new duty stations and how to get your family situated. We’re covering different areas, served by the nationwide network of real estate professionals that make up PCSMoves.com. Click here to read our entry on Bethesda, MD. 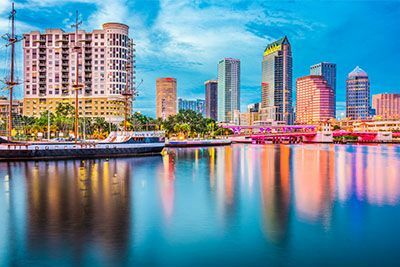 Tampa is a major city on the west coast of Florida, near the Gulf of Mexico. It had an estimated population of 377,165 in 2016.Several Fortune 1000 companies are headquartered here, including OSI Restaurant Partners, WellCare, TECO Energy, and Raymond James Financial. The area is also home to MacDill Air Force Base (MacDill AFB). If you’re moving here without a place to live, check out the Air Force Inn. Staying at the inn can take off some of the pressure you might be feeling while looking for a place to live. The Inn offers rooms with microwaves, refrigerators and free Wi-Fi, as well as a business center, playground and laundry facilities. For reservations for pet-friendly rooms, travelers are advised to contact the Lodging office directly for accurate reservations, at 813-828-4259.If they aren't, the staff may be able to give you some local kennel information. Be sure to ask if there will be any pet fees due at check-in. The closest military veterinary clinic is the MacDill Veterinary Clinic, located on the base. They offer pet exams, immunizations and treatment. However, the clinic doesn’t offer pet boarding. If boarding is required for any reason, call the clinic and ask whom they would recommend. If you’re on the lookout for base housing, as opposed to temporary lodging, the MacDill AFB Housing Management Office (HMO) is located at 8414 Fortress Drive and can be reached at 813-828-3166. Transferring military personnel should apply for housing as soon as they know MacDill will be their new duty station. The HMO provides all personnel with personalized services to assist in locating suitable housing in the local community. The HMO will assist you every step of the way to help you find your new home in the local community. If you rent a home, the median rent price in Tampa is $1,450, which is the same as the Tampa Metro median rent. Doing a PCS move with a military pack out gives you a bonus of not having to worry about storing your personal belongings while you’re looking for a place to live. Your household belongings may take longer to get to you, but your items can be stored for you if they arrive while you’re still looking for housing. If you might have made this as a personal move, chances are you didn’t bring everything with you that you owned in your previous home. If you need to pick up some items, the MacDill Main Exchange is located at 3108 N. Boundry Blvd. And if you’re a fan of thrift stores, be sure to check Yelp’s list of “The Best 10 Thrift Stores” in Tampa Bay. There is also the usual assortment of Target and Wal-Mart stores in the area as well, so finding your favorite brands of everything shouldn’t be a problem. If you have young children that may need care because of your work schedule, be sure to look into the MacDill Child Development Centers, for hourly and weekly care for children as young as 6 weeks through 5 years. The Family Child Care program consists of home community care, supplemental childcare and more. There are also special programs for pre-teens, teens and youth sports. Once you’ve settled in Tampa and you’re a milspouse looking for a job, MacDill AFB also has a webpage dedicated to Non-Appropriated Funds (NAF) jobs. This site is updated every Monday. But your new life in Tampa can’t revolve around what’s on-base. Grab your family and have some fun at Busch Gardens! Located about a half-hour southwest from MacDill AFB,Busch Gardens Tampa has an actual zoo, with more than 12,000 animals from 300 different species, tucked into the park among all of its rides! Make sure you also check out Waves of Honor to find out what free tickets and discounts for which you and your family are eligible. If you’re an active duty military member or a veteran, you could get free tickets to SeaWorld Orlando, Busch Gardens Tampa or Aquatica Orlando. However, these offers are not available at the parks, so you do have to request the tickets online. Other parks in Texas and Pennsylvania are also a part of this program. If you’re still looking for more of what Tampa is like, follow PCSMoves on Pinterest to check out our “How To PCS Like A Pro” and our “Life in Tampa, FL” boards. Where has been your favorite place to live? Share with us in the comments! Thinking about looking for a new home because of a PCS move? Start your search with us!